The 11 CGIAR genebanks conserve 768,576 accessions of cereals, grain legumes, forages, tree species, root and tuber crops and bananas. Many of these accessions are crop wild relatives. This is the largest and most widely distributed collection of genetic diversity available under the Multilateral System of the ITPGRFA. Over the past 10 years, CGIAR genebanks have distributed more than a million samples to plant breeders and crop researchers. From 2012 to 2016, more than 590,000 samples went to 120 countries. The disease-free status of the plant material being distributed is ensured by germplasm health units (GHUs) associated with each genebank. 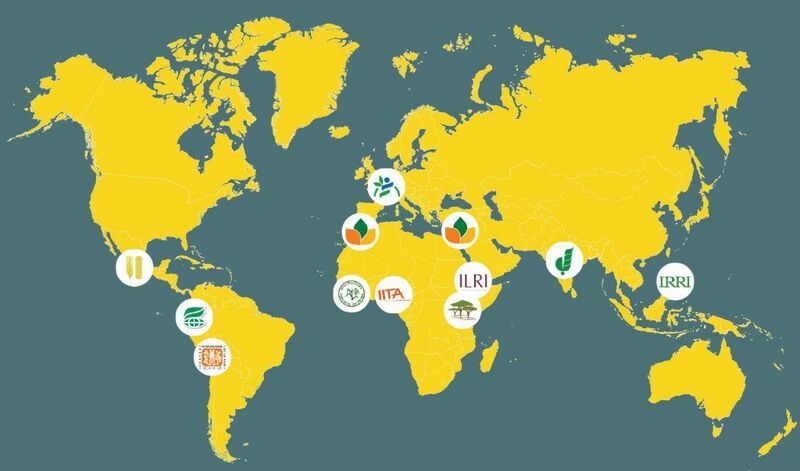 The accessions in the CGIAR genebanks are international public goods that the genebanks make available under conditions set out in the International Treaty on Plant Genetic Resources for Food and Agriculture. Recipients of material agree that they will not further restrict the availability of such material and, if they do restrict access to new varieties derived from genebank material, they will pay a certain percentage of the proceeds of commercialization into a common fund. CGIAR genebanks were responsible for 94% of the germplasm distributed under the ITPGRFA in 2014. Their status as international collections obliges the genebanks also to conserve and make available the collections using procedures and conditions that uphold the highest standards. The CGIAR genebanks have a fully documented and verifiable standard operating procedures as part of their quality management systems. In addition to preserving crop diversity useful to future agriculture, genebanks can also contribute directly to improve the livelihoods of farming communities. For example, several genebanks have restored lost and forgotten landraces and farmer varieties to communities from which they were collected. Many are also working directly with national breeding programs and farmers in participatory breeding and selection activities to help them adapt their farming systems to the challenges of climate change. The CGIAR collections will not in and of themselves increase food security or ensure sustainability. They are, however, essential to all such efforts. Holds the world’s largest collection of African rice, Oryza glaberrima in a collection of 20,000 accessions. The genebank has just been transferred to new facilities in Côte d’Ivoire. Responsible for the International Musa Germplasm Transit Centre hosted by the Katholieke Universiteit Leuven, Belgium. The collection of about 1,500 banana and plantain accessions is maintained as tissue culture and in cryopreservation. International Center for Tropical Agriculture. Maintains large and diverse collections of beans (38,000 accessions), tropical forages (23,000) and cassava (6,600) in Colombia. CIAT maintains these crops in seed, field and tissue culture collections in multiple locations. International Maize and Wheat Improvement Center. Houses outstanding wheat (153,000 accessions) and maize (28,000) collections near Mexico City. The genebank is ISO certified (ISO 9001), and the GHU is ISO accredited (ISO 17025 ). The genebank distributes up to 50,000 samples a year. International Potato Center. Manages the largest in vitro collection in the CGIAR, including potato, sweetpotato and Andean root and tuber crops located in Lima, Peru. CIP is currently cryobanking its potato collection for longer-term storage. World Agroforestry Centre. Conserves domesticated, partially domesticated and wild tree species used for fruit, timber, medicines and other products. More than 180 tree species are held as seed accessions and 43 species are conserved in field collections at 38 sites in 15 countries, mostly in Africa but also in Bangladesh, Peru and Vietnam. International Center for Agricultural Research in the Dry Areas. Conserves 145,000 accessions of crops and forages native to the Fertile Crescent, in two sites: Morocco for cultivated material of barley, chickpea, grasspea, lentil and wheat; and Lebanon for crop wild relatives of cereals and legumes. International Crops Research Institute for the Semi-Arid Tropics. Based in India, with outstations in Africa, manages 125,000 accessions of chickpea, groundnut, various millets, sorghum and pigeonpea. ICRISAT pioneered the use of mini-core collections to make access to crop diversity easier. International Institute of Tropical Agriculture. Manages several crops important to Africa, as seeds (23,000 accessions) and as clonal collections (9,000). Crops conserved include banana, cassava, yam, maize, soybean and crops such as Bambara groundnut, cowpea and African yam, bean, less well known but nonetheless vital for local food security. Based in Nigeria. International Livestock Research Institute. Based in Ethiopia, holds almost 19,000 accessions of 1,723 tropical forage species. The collection is taxonomically very diverse and comprises mainly wild species, in a new and fully modernised facility. International Rice Research Institute. Holds almost 128,000 accessions of rice varieties and wild relatives at its facility in The Philippines. IRRI has pioneered research on seed conservation, improving the efficiency of its operations and extending the longevity of stored samples.